This is breathtaking. Black in color, with incredible aromas of crushed blackberry, mineral, licorice and lead pencil. Full-bodied, with a mind-blowing texture of seamless tannins that coat every millimeter of the palate. Goes on and on, with licorice, currant and flowers. Time will tell if it's better than the 2000. Best after 2017. 95-97 Barrel sample. A big wine with dense tannins, but so elegant. Dark, intense, with layers of acidity underneath that only show through at the end. Unusually, Cabernet Sauvignon dominates this wine, a sign of the ripeness of the Cabernet fruit. ($400-$500) Saturated ruby-red. 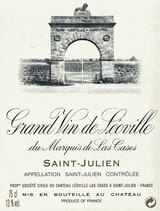 A confiture of dark berries on the nose, with a complicating torrefaction note of coffee. Fat, sweet, plump and full, with a silky, enveloping texture rare for this wine in its youth. The highly concentrated cassis, violet and bitter chocolate flavors really take over the mouth and stay awhile. The huge, chocolatey finish features big, ripe, building tannins. One can easily taste this massive wine today, but there are great reserves here to ensure a long and slow evolution in bottle-and I would not be at all surprised if it shut down soon for a very long time. Our cabernet sauvignon was perfectly ripe in both '05 and '06, noted cellarmaster Rolland.